Location: Some 80 metres from the Turf Pit track junction, at a bearing of 285°. A 1m square stone lying on its back, alongside Meer Stone 27. 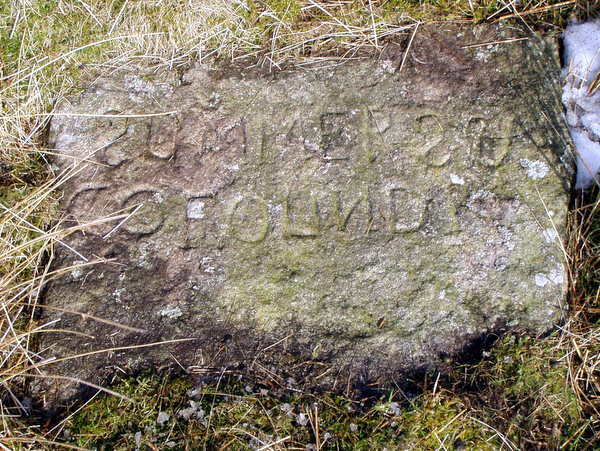 A founder stone, this marks the south-west corner of the 6 meer lease held by Summers and Company, and shown on the 1781 Brailsford survey. The 'S' and 'N' are carved in mirror script. A drawing of the stone may be found on page 3 in The Mines of Grassington Moor (see references). A Ralph Summers, 'miner agent', was buried at Linton in May 1792.